I’m not going to attempt summarizing the plot of Vanamala and the Cephalopod in a paragraph, but this is how it all begins. Vanamala puts up a notice in Thambi’s shop advertising the sale of her sister, Pingu, age eight. Now, Kanti Stores is no ordinary provision shop. A mysterious trough in the back room gifts Thambi with pretty baubles on a regular basis. Whatever-it-is-in-the-trough takes Vanamala’s notice seriously and Pingu goes missing. Guilt-ridden, Vanamala sets off in search of her sister. This leads to underwater escapades of the strangest kind. En route, all sorts of fantastical creatures make an appearance - the Tower Bird, the Lettuce Grower, the Boss … My favourite is Basavan the bull (okay, zebu). As I read, I felt I had stepped into Alice’s Wonderland or Roald Dahl’s magical world. Nothing like it has been attempted in Indian children’s fiction in a long time. 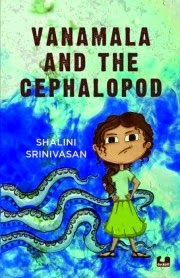 The author, Shalini Srinivasan, is clearly a nature-lover and wildlife enthusiast. The writing is powerful and smattered with witty philosophical thoughts. The voice of the grumpy pre-teen is pitch-perfect and the story is set firmly in the district of Mandya near Mysore. From the names and references, my guess is Vanamala lives close to (or in!) my ancestral village. Who would have thunk? For someone like me who is particular about the aesthetics, there is plenty between the pages to drool over – fonts, borders and gorgeous illustrations. No amount of gimmickry can salvage a badly written story, but great design and production values can elevate the reading experience of a well-written one, and that is exactly what happens here. There is, however, the usual problem – a sagging middle. I found my attention wavering, although I discovered that it all ties together neatly in the end. The parts featuring the Cephalopod were a bit of a letdown, considering I had very high expectations. 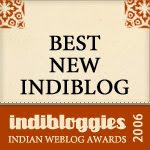 I had also been hoping to see more of Thambi, so I was thrilled to find these stories online. The book picks up again and ends with what can only be construed as the promise of a sequel. Beautifully done. I was sent a copy of the book in return for an honest review.